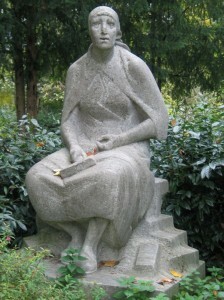 ‘A dress full of color and joy for the Trümmerfrauendenkmal’ is intended as an homage to the Trümmerfrauen (rubble women) whose contributions were decisive in the rebuilding of Berlin after WWII, and to all women around the world whose contributions are of the utmost importance in building and maintaining the fabric of society today. 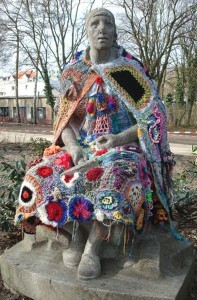 Since the Anarchic-Crochet-Circles for the Trümmerfrauendenkmal that took place during the ‘Threading Trends’ exhibition organized by Galerie R31 in the Alten Post in Neukölln in November 2008, more than 110 individuals from a wide range of backgrounds have contributed crocheted creations filled with color and joy to a dress for the sculpture. The ‘dress full of color and joy for the Trümmerfrauendenkmal’ action culminates in a textile Installation accompanied by performances with the PerformUnion as part of the 48 Std. Neukölln festival in June 2009 at the site of the monument of the same name in Volkspark Hasenheide in Berlin. 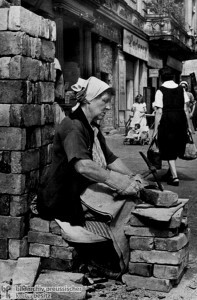 The fact that the ‘women’s work’ around the world is still under-valued, the never-ending destruction of cities and the environment in which we live, the dividing – rather than uniting – of cities, countries and societies, the rebuilding that is constantly necessary as a result, and, in a specifically German context, the 20th anniversary of the fall of the Berlin, and the 60th anniversary of the German Constitution. How many generations does it take to come to terms with the tragedies and traumas of war and social upheaval?